I love statcounter, even tho I have passed the 500 user visit, it is still so useful. Great tool. Have you written something on how to restrict the number of stories that show up in a Blog's RSS feed? Like say, just the five most recent ones. Plus, anything on heatmaps? Like Click Heat and Click Density...something simple and free for Blogger (for those who are not using a custom domain). It is such a great tool for someone to know what a user is clicking on. Maybe not exactly what you want but why don't you try Google Analytics. It has lots of data but I am too lazy to try it out thoroughly as it has too much statistics for me. Try it and let me know how it is. I installed an invisble STATCOUNTER on my blog yesterday, and it seemed to work fine, data was coming in. But at the end of the day a friend told me he couldn't load my blog properly... And more people told me so today. In some cases they get kicked out within 5 seconds, in other cases the blog stops loading and they can't scroll down. I assumed it had to do with the counter, so I deleted the project, both on the Statcounter-site and from my Page Elements. But the problem remains. Could it have something to do with an embedded clip or .gif? I am using Vista and Firefox 3.0 myself and the blog is not giving me any problems whatsoever. Thanks Peter, hope to hear from you soon! Hahaha! I know what you mean. I was looking at Google Analytics just that morning... i didnt spend much time on it when I was told I will need to have access to the folder structure of my blog to be able place Analytic's code into it. Got a little put off by that because i dont have access to that. I have installed hundreds of statcounters in hundreds of blogs and none gave any trouble. My problem is SOLVED, somehow... I reinstalled StatCounter and everthing is back to normal. Phew. One guy told me it could have had to do with the top-post being a YouTube-clip, or maybe a server-thing. You can delete my 'problem-comment', if you like. I thought I saw you at the town hall meeting. Did you go. Hi there! I'm afraid what i have to say has nothing to do with this post, but since you have such know- how on the matter of blogs and blogging i will do it anyway since I have a problem. The problem is that i have had a blog for almost three years (http://punhado-dolares.blogspot.com) and some readers have been complaining that the blog page takes ages to open. I suppose this has to do with the fact that over the years i have posted tons of photos, videos and music and so the blog is «heavy». So, now I created another blog, took with me the layout of the first one and i intend for it to be the «second edition» of my original blog, with the exact same appearance but without all those «heavy» posts that I will leave behind in the «first edition» (obviously i will leave a link in my last post to the new blog and I will have a link in the new one to the old). Now, the problem is with the side bar content. When i paste the layout of the old into my new blog, all the content of the side bar (links, photos, widgets and miscellaneous stuff)is gone. Of course, I can edit manually, one link at a time, etc, but this is fastidious and slow work. Is there any way to «duplicate» the layout (including the side bar content) to my new blog without all this trouble? Thanks in advance, excellent work you are doing here. I see that the pixels from your Profile photo have all jumped off the screen and I hope that doesn't signify some shake-up, maybe that your blog has been purchased by ruthless business tycoons who have sent you into a Real Retirement! Just another Blogger Glitch, I'll assume, though, until more evidence is available! adsense has become more selective. Those blogspot blogs might have got approved long ago. However, perhaps you can try to apply direct from Blogger (I haven't tried this as I got my account long ago but it is worth a try) Prepare some good content before you try again. I've used Statcounter and love it. totally, i think it's kool. It's a great source of data. Have anyone purchased the upgrade? and is it worth it? I have been using Statcounter for years and have been very satisfied. You only need to pay if you 250,000 pageloads per month or if you want statistics on more than 500 pageloads at a time. I've been using StatCounter and very happy with it, though you taught me a couple new things. Thanks! Someone recently sang the praises of Google Analytics so I put that on my blog also, but honestly am not impressed yet. 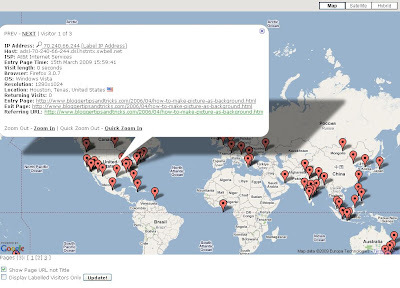 I've been using statcounter for both my blogs and love it...gives great details info and the map is excellent.